The feeling of foreboding, palpable. The London air, thick with fog. And while the air raid siren brings forth the ominous sound of danger to the masses, planting another round of strategic bombs on the UK during World War II, a baker in a small pie shop discovers a recipe that is both disgustingly haunting and painfully delicious. 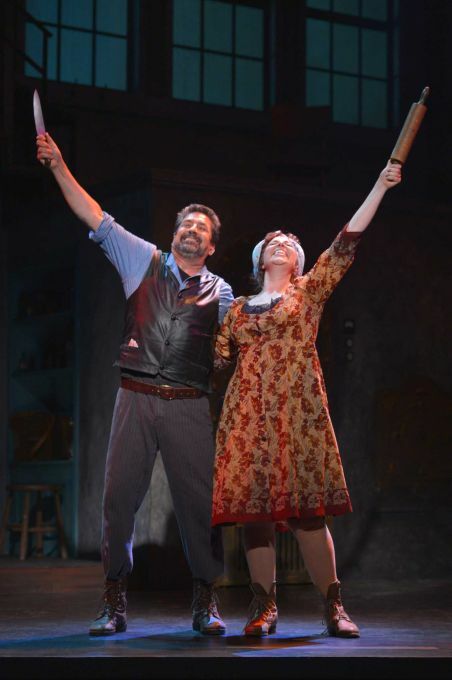 Stephen Sondheim’s composition and lyrical masterpiece “Sweeney Todd: The Demon Barber of Fleet Street” is handled magnificently in all its gory and macabre splendor in a splendid production at TheatreWorks in Mountain View. The production, with a book by Hugh Wheeler, is most-certainly anchored by a plethora of wonderful individual performances that blended together as beautifully as the complicated harmonies that were consistently being hit. Sondheim’s dark and scintillating masterpiece, first debuting on Broadway in 1979, has consistently been one of his most produced works, It follows the tried and true formula of a man motivated by pain, and sucked into a dreadful world of greed and gore. After all, Sweeney Todd (David Studwell) has returned to London from a cruel exile at the hands of the vile Judge Turpin (Lee Strawn), motivated by the lust he has for Todd’s wife Lucy. The scope of Todd’s life changes dramatically when he returns to the old room he used to rent from Ms. Lovett (Tory Ross), above her pie shop that serves a truly awful product that might have been inspired by year-old cardboard. Other story lines are just as compelling. There is Todd’s loyal friend Anthony (Jack Mosbacher) and his virtuous, passionate pursuit of the lovely Johanna (Mindy Lym), a ward of Judge Turpin. And there is the young Tobias “Toby” Ragg (Spencer Kiely), who begins to work with Ms. Lovett and eventually has a few doubts of his own. The sharpness of the performances fit beautifully with the unity of the overall piece. What strikes the audience is how the production is so consistent in every phase. Director Robert Kelley has unified all the pieces of this tale sharply and succinctly, and its immediacy is striking. It starts with Andrea Bechert’s wonderful set, which is loaded with delightful bells and whistles with stunning depth and effective negative space. Certain plays don’t always fit very well on the vast stage at the Mountain View Center for Performing Arts, but certainly this one feels very intimate and dark, with Kelley’s direction hitting the right tone throughout. There is much to love about the production, and as stated before the strength of the performances soared. Studwell is effective in his tone and phrasing in the biting lyrics and notes that make up Sweeney Todd, a role that requires a piercing bass-baritone. He plays individual moments well in a character as rangy as Todd. Whether it’s the pain of loss, the glee of his shears or the rage that tears him apart, Studwell found wonderful commitments in many sharp moments. While both Studwell and Ross did a lot of the heavy lifting in the form of principal characters, the cast was strong all the way around, a wonderful ensemble that did much to create the texture of the piece. Popular South Bay actor Martin Rojas Dietrich was gleeful as the slimy parasite Beadle Bamford. Noel Anthony’s portrayal of Adolfo Pirelli was delightfully foppish. Lee Strawn was disgustingly dastardly as Judge Turpin. Kiely’s Toby was strong as he pursued a young man in search of the truth, making strong discoveries as the story progressed. And Mia Fryvecind Gimenez brought about a wonderful turn as the Beggar Woman, playing a character full of mystery. TheatreWorks’ production has taken some bold leaps forward with their concept, which allowed a solid, spectacular production. What works so well is that despite every solid element in the drama, the production never shies away from the fact that Sondheim’s music is the star of the show. To put it another way, this production is as delicious as a…well, you know.